Specs: Summit elevation: 8540′; Base elevation: 6700′. 6 Lifts: 3 quads, 3 doubles. Uphill capacity: 7900/hr. Terrain Mix: 18-46-36. Longest Run: 13,200′. Season: usually mid-December to mid-April. Lessons & Rentals. Annual Snowfall: 300″. Snowmaking: 75%. The SKInny: Although Diamond Peak has the 4th longest vertical, it ranks way down the scale in terms of crowds and traffic, which is always a plus. You could probably call this a “family” atmosphere. Snowflake Lodge at mid-mountain is always a hit. Hotshots will want to show off on the California side, and wanderers will be spoiled by the sizable resorts on the other side of the Lake. Truth is, if this were the only ski resort in the Lake Tahoe area, Diamond Peak would be one of the top ski destinations in the world. A great ski area overshadowed by its neighbors. Signature Trails: Ridge Run, Solitude Canyon. Specs: Summit elevation: 6900′; Base elevation: 6200′. 2 Lifts: 1 double, 1 ropetow. Uphill capacity: 1000/hr. Terrain Mix: 33-34-33. Season: usually late November to late March. Open Fri-Sat-Sun plus holidays. Lessons available through the Ski Club. Snowmaking. The SKInny: Elko Snobowl is a great little area that appears to be operated by the Elko Chamber of Commerce (at least that’s where you buy tickets). It’s a wide-open bowl with a full range of skiing terrain. Prices are cheap; highest ticket is $15. Beginners can use the rope tow at no charge (as of this writing). A shuttle bus brings the kids from town. More communities should follow Elko’s lead and operate ski areas, even though few would be able to manage one of this size and stature. If you’re in the area, stop by and make a few runs. Specs: Summit elevation: 9500′; Base elevation: 8500′. 3 double chairs. Uphill capacity: 2500/hr. Terrain Mix: 20-60-20. Longest Run: 3,000′. Season: usually late November to early April. Rentals & Lessons. Annual Snowfall: 120″. Snowmaking: 75%. The SKInny: Truly a “southwest” type ski area. Uncrowded, reasonably priced, plenty of decent snow. Only negative is that it really doesn’t have a lot to offer the novice or “developing” skier; fairly big leap from bunny hill to main hill. Hotshots and wanderers will not be overly thrilled, but hey, where else you gonna ski in Las Vegas? Steady improvements to facilities and all around since Powdr Corp. took over. Specs: Summit elevation: 9700′; Base elevation: 7900′. 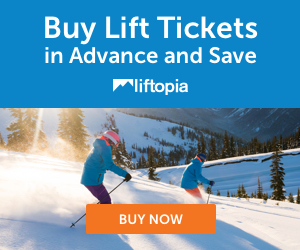 7 Lifts: 2 sixpacks, 2 quads, 2 triples, 1 magic carpet. Uphill capacity: 13,400/hr. Terrain Mix: 20-30-50. Longest Run: 12,500′. Season: usually late November to mid April. Rentals & Lessons. Annual Snowfall: 400″. Snowmaking: 28%. The SKInny: Newly lengthened vertical, new sixpacks, new loading stations, new, new, new. I guess this may bring larger crowds, but I think the uphill capacity can handle it without even slightly taxing the equipment. This has always been an outstanding ski area, now even better by all the improvements over the past few years. Maybe the only reason it doesn’t get as crowded as neighboring resorts is the brutal wind, but that’s the only downer we know of. Lots of room to explore; plenty of hot drops for hotshots. Signature Trail: Central Pacific to Slide Bowl. Specs: Summit elevation: 11200′; 0 Lifts: Heli-skiing; a minimum vertical uplift is guaranteed with package. Terrain Mix: 0-0-100. Longest Run: 12,500′. Season: usually January to mid April. Rentals; no lessons. The SKInny: Operating for close to three decades, this is one of the better-known, more respected heli outfits. First-class all the way.